Description: Italian Wire Mesh Ribbon is made with super fine brass wire. It is woven into a tube and then flatten for spooling. The color is achieved through an enameling process. Because the ribbon is made with wire, you can heat the mesh ribbon up to 275 degrees without color degradation. Think of the possibilities in adding textures to polymer clay or to mix-media projects with embossing powders using a heatgun. When ruffled the Wire Mesh Ribbon creates what appears to be a wire webbed lace. To ruffle you only need to pull the ribbon horizontally (side ways). The ribbon will expand up to 2.5 times it's originally width. To decrease the diameter of the ribbon simply roll between your hands side to side. To straighten, pull the ribbon vertically (up and down). Because this ribbon is made of fine wire and wire will work harden overtime take care not to over stretch the ribbon continuously to avoid breakage. Because the ribbon is tubular you can insert beads, wire or any other object you wish to capture. Your captured treasures will have a webbed look. Think of closing the end again and adding a bead or ornament outside. Creating a needle is easy, just roll the end of the ribbon with your fingers. When done re-stretch back to a flat ribbon. The sample necklace (not included with your purchase) shows the use of wire mesh ribbon as decorative embellishments. Simply create your design first. Then cut your wire mesh ribbon into 2.25 inch increments. Tie an overhand knot where you'd like to add your embellishment (over silk thread, inside a loop, into a chainlink, or over a jumpring). Add a dab of GS Hypo Cement to stop the ribbon from fraying, let dry and then stretch to create organic leaves. It's as simple as that. Your design will be transformed adding beautiful texture and movement. To string an entire necklace using mesh ribbon, keep in mind the weight of your components. Too heavy and you will lose your stretch. To counteract this effect and keep your ruffles where you'd like them, simply string beading wire in and out of the mesh (in a wave pattern) to give the necklace structure. Also, if you desire a lot of ruffles keep in mind that when you stretch the mesh you will shorten the final length of your ribbon. So in order to create an 18" necklace you may need as much as 36" of ribbon. You will also need to use E-6000 to create a gummy surface before attaching to your ribbon end for a finished look. - Add to your felting projects for interesting textures. 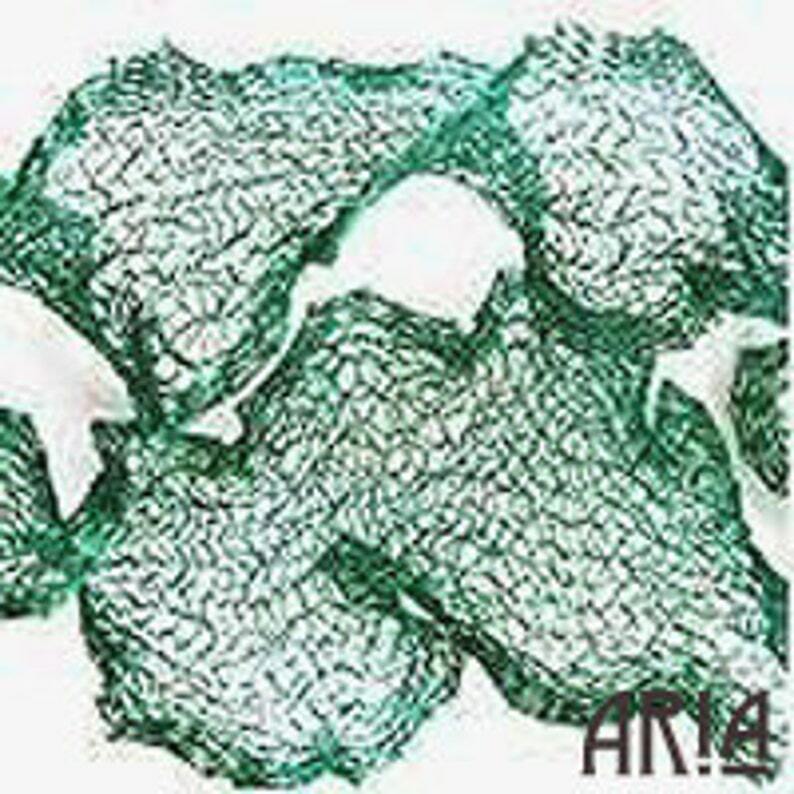 We carry 28 shades of 6mm Italian Wire Mesh Ribbon. We have absolutely the BEST and LOWEST price in the industry because all of our colors are the same price. If you need a different quantity, as long as you purchase five or more spools, simply convo me to create a special listing for you so you'll save $1 per spool. All images, designs and listing content are copyrighted 2013 Aria Design Studio. All rights reserved. Order arrived quickly and the color is very rich!